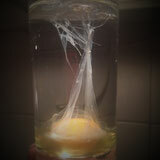 This is one are of the sample image of what an Aura cleansing with an egg has absorbed and removed from the body of a client of mine. Stuck bad energy. A healthy person (in mind and soul) should have a clear water. This aura cleansing is an ancient South American Shamanic form of healing. It’s been used for centuries and it is still used today in some South American countries. In Peru known as "Egg cleansing" it uses a combination of traditional palo santo smoke therapy, egg absorption, herbs and powerful intentions. When we are open to energy, it is able to penetrate both our bodies’ natural defense systems and what we repress emotionally. Unpleasant feelings, experiences or thoughts, manifest themselves physically. Feelings that we haven’t been able to process, and areas that we keep hidden from ourselves affect us;They affect our energy and, therefore, our thoughts, feelings and behavior. With this method we can get into these dark pockets and work its way in and through. A single cleansing only begins to penetrate these pockets. Like anything that has sat and hardened, these dark pockets can be difficult to penetrate. When a person has spent most of a lifetime out of balance, a single cleansing session rarely achieves equilibrium. People require several sessions for the energy to take a strong effect. Life has no “cure-alls”; we need to keep ourselves in balance. Children are extremely sensitive to energies, and easily absorb strong and bad energies. Most of the time, they don’t know how to manage or release it, and they become uneasy. Aura cleansing is a great tool to balance them. Like other shamanic techniques, this cleansing will temporarily balance a client. However, clients who continue a lifestyle of poor habits or whom maintain close relationships with the wrong people, will quickly return to unbalance state of imbalance. A person receiving an aura cleansing will increase their ability to maintain a higher “vibration” with each session. Generally, progress towards raising a person’s vibration more permanently becomes visible after the first three to five sessions, depending how deeply hidden the problem is. The number of sessions required varies between individuals, as a person’s reactions and life choices will be a great determining factor. A session will take around 30 min. The person will be lying down with their underwear on a massage bed and an egg will be passed over the whole body. After the session you will be able to see in the egg what has been removed from your etheric body. I have been passed this very special knowledge from my grand aunt who has been healing our entire family for more than 60 years. Her grandfather was a great Shaman healer and was very well known in his hometown for healing many people. I have integrated my knowledge of Sekhem (Old Egyptian healing method) with this shamanic aura cleansing method, making it a stronger energy tool. • Releases stress, stagnation, blocked areas. • Brings balance to your physical and emotional health. • At the end of the treatment, people usually feel light, calm, balanced and relaxed.